Easter eggs of various styles for sale in the Brno Easter market. One of the major holidays on the Czech calendar is Easter. Let’s take a look at some of the customs and traditions observed in the Czech lands on this holiday. 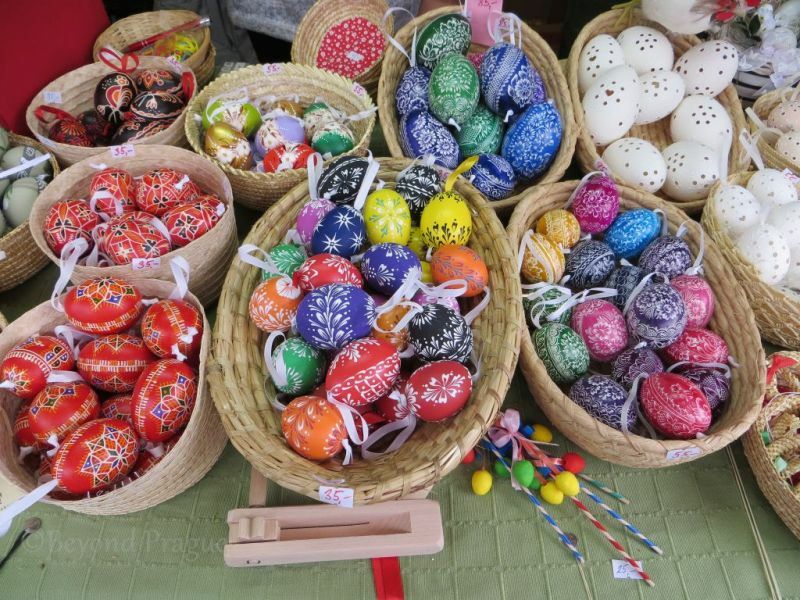 In the week or so leading up to the Easter weekend, many vendors set up stalls on the streets to sell a variety of traditional items such as Easter eggs, fresh willow branches, spring flowers and a wide variety of pomlázkas of varying complexities, sizes and prices. 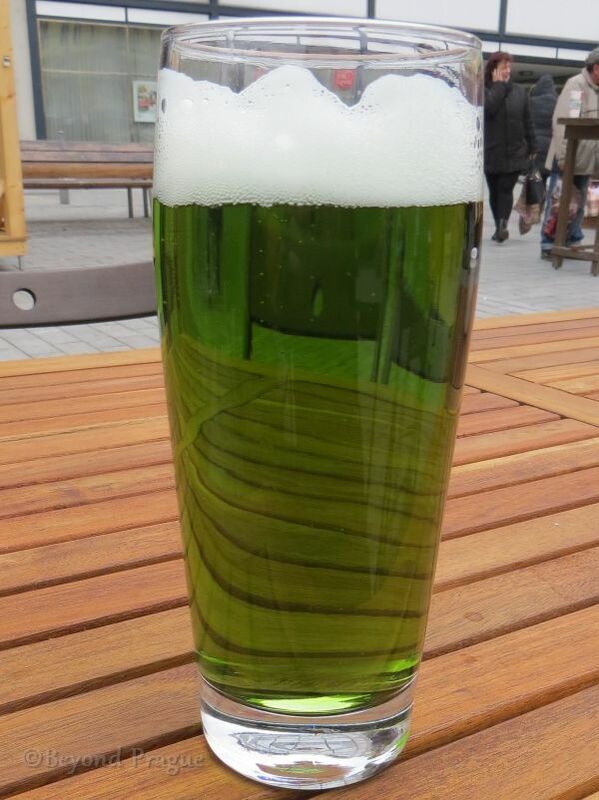 A tradition of a more contemporary nature includes many pubs offering green beer on the Thursday before the Easter weekend. Pomlázkas of various sizes for sale on Česká street in Brno. 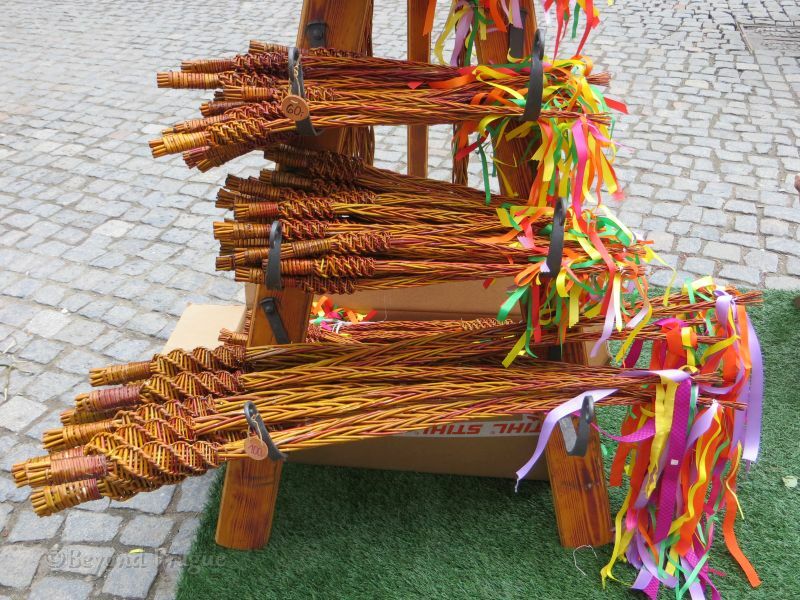 The pomlázka is a central symbol to Czech Easter traditions that dates back to pagan times. It is a whip made from braided, fresh willow branches and used by boys and men to symbolically whip their female relatives and friends. According to tradition, the whip is used by boys to lightly beat girls around the legs to chase away evil spirits and bring health and keep her young through the coming year. As the boy whips the girl, he recites a traditional poem and the girl rewards him with a coloured egg and some sweets. In a contemporary context, the rewards for the beating and the poem are more likely to be sweets for young boys and a shot of alcohol for men. These days, it’s less about serious tradition and more about fun. Somewhere between tradition and the present day, it seems a lot of men have lost sight of the fact that the whipping was meant to be gentle and symbolic. As such, a lot of guys get quite overzealous with the beatings and a lot of women are happy to see the back of Easter before it even arrives. As a general rule, girls and women do have the opportunity for revenge as boys and men must stop the beatings by midday. In the afternoon, girls and women are free to take up the pomlázkas and return the beatings. A variation on the theme you may hear about is splashing girls and women with water; this is an aspect of Slovak Easter customs. 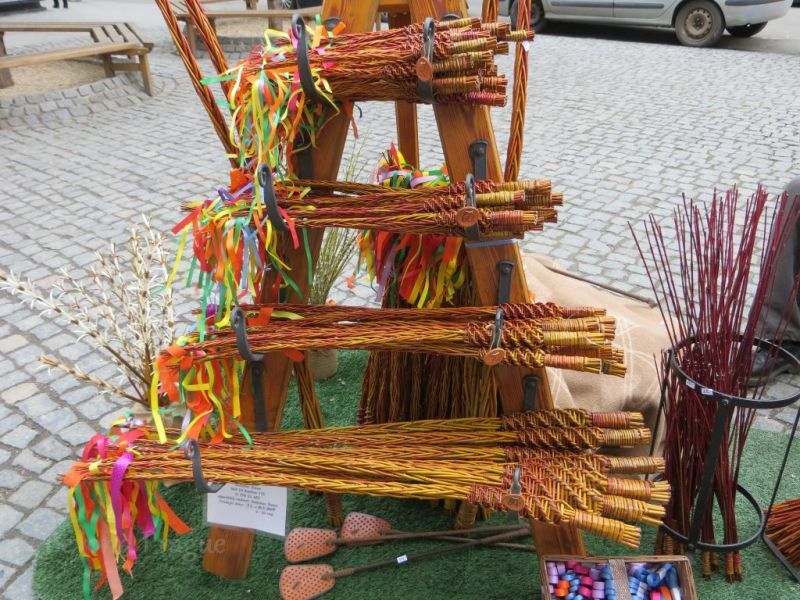 Another typical symbol of Czech Easter is an arrangement of fresh willow branches or pussywillows in either a door hanging ornament or in a vase in the home somewhere. Further variety in Czech Easter eggs. 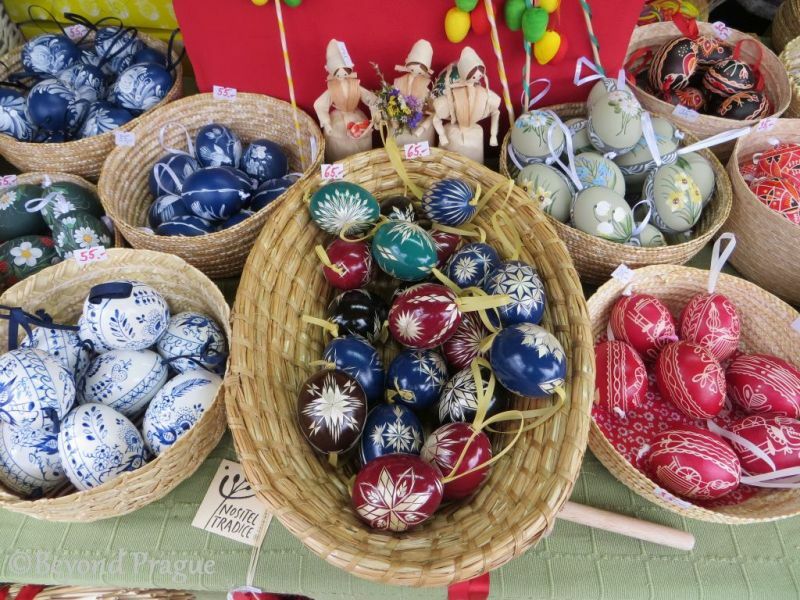 Like so many cultures that observe Easter, the Czechs colour and decorate their fair share of eggs for the occasion and you will find many for sale in street markets in a wide variety of styles determined by region, traditions or simply the personal tastes of the person who decorated them. 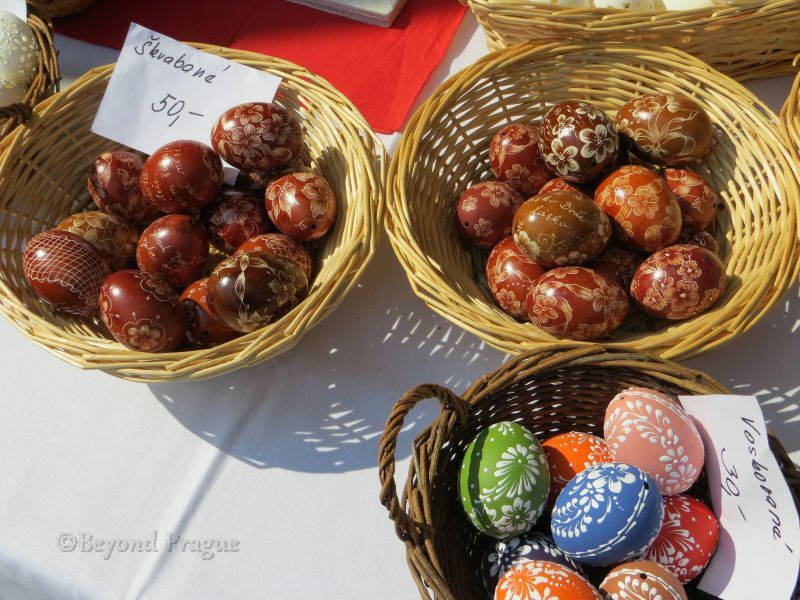 There is no hard and fast rule to concretely determine what is a Czech Easter egg and what is not, though red and other bright colours figure prominently as they represent new life, health and happiness. Some eggs are simply painted freehand with a paintbrush while others are painted in a much more rigid and regimented pattern that requires beeswax and other masking techniques to achieve. Still other eggs are dyed a solid colour and have artfully cut bits of wheat straw glued to them. You will also find eggs with ribbons run through them so they can be hung and other eggs decorated by holes and intricate cutouts in their shells. If you find yourself in the Czech Republic around Easter, you will certainly notice that every bakery is selling cakes shaped like sheep and many department stores are selling metal or ceramic cake forms for those who wish to make their own sheep shaped cake at home. Traditionally, the Czech Easter meal was baked lamb. However, lamb is not a common meat in contemporary Czech cuisine and this special shaped cake was created as a symbolic stand in for the actual lamb. Needless to say, that has elevated lamb from main course to dessert at the Czech Easter table. To the more traditional and devout minded individual, the Thursday before Easter is known as Maundy Thursday. The day commemorating Christ washing the feet of the apostles and the Last Supper. There are a number of theories as to why the day is called Green Thursday in the Czech lands, though most Czechs I’ve asked tend to gravitate to the explanation that the day was traditionally one of meatless dishes and green vegetable dishes were served instead. Typically, restaurants that serve lunch menus will have strong vegetable component in the meals on offer. Spinach is a very common ingredient to make Green Thursday lunch dishes more green. In the last decade or so, breweries have made their mark on the day by making limited batches of green coloured beer. Some say this is because spinach and other green vegetables are not to everyone’s taste. However, it may simply be a good excuse to work beer into existing traditions. To some, this may seem disrespectful or blasphemous on the day. However, it’s a very Czech thing to do all things considered. While many Czechs are very devout, they do tend to come across as a much more secular lot when compared to the much more religious populations of their neighbouring countries. Yet more pomlázkas for sale. My first Easter in the Czech Republic was my only true culture shock moment in the country. I’d been here a little bit less than a year and nobody had told me anything about Czech Easter traditions. Naturally, coming from a place where a guy beating a woman in any way would get him at least a visit and strong talking to by the police, I was floored at the prospect; not to mention a bit suspicious of possibly being set up for a joke. Easter Monday came and, with whip in one hand and poem in the other, I went about gently beating my girlfriend. As she finished laughing at the atrocity I had committed against her language while reciting the poem, she handed me the sweets and I thought to myself that Salvador Dali would have trouble making this day any more surreal. I was about to be proven correct. Shortly after beating my girlfriend, she told me that a female friend of ours who lived up the street was expecting me to come over and beat her. As I proceeded to our friend’s home with my pomlázka and poem in hand, seeing a few other guys out there doing similar, I decided that surrealism might be giving way to something more resembling fetishism. I’ve since learned that the pomlázka is, in ways, a bit like the Easter Bunny to some people here. It’s typically the territory of nostalgic parents with little children. I’ve met more than a few teenage boys and young adult guys who don’t partake in the activity at all.